Since years I am interested in Asian warfare. Ancient Japan and China was always a place special to my imagination. Asian warfare, especially Sun Tzu and the Bushido Code of honour had fascinated me for years. I have countless books about Samurai and Chinese armies. As far as miniatures and miniature games are concerned I was less enthusiastic. That changed when Clan War was coming out. Great setting and great minis. Unfortunately their later minis were less then good and all in all the game fumbled quite well.I still like the game, but nobody is playing it. The setting itself is still one of my favourite Fantasy settings. I can only recommend the Clan War novels. 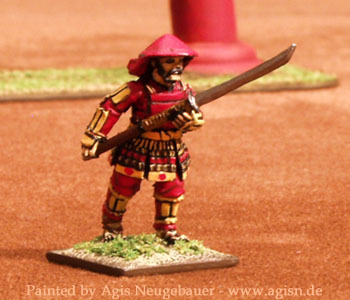 As minis are concerned right now I like the “The Age of Wars - Samurai Armies 1550 - 1615” range from the Perry twins, the new “Medieval Asia” range from TAG and very recently the Martial Arts range from Hasslefree. 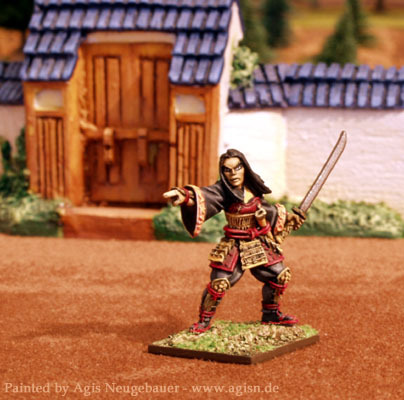 This small group of Ashigaru is joined venture of Steve Dean and me. I finally talked him into painting some minis for me. I provided one painted example and some pictures from books to give him an idea of the colours. All the rest is his brushmagic. A male Shungenja (Tadaka of the Phoenix Clan) from the fantastic Clan War setting. Still a very nice miniature IMO. 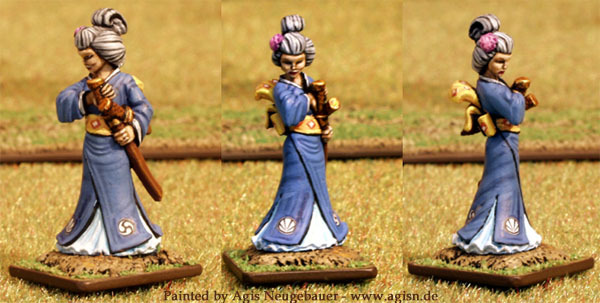 The female Samurai is from Hasslefree’s Range. I painted her as a Crane (The Crane are one of the Clans of the Legends of the 5 Rings Asian fantasy setting) Samurai-Ko. 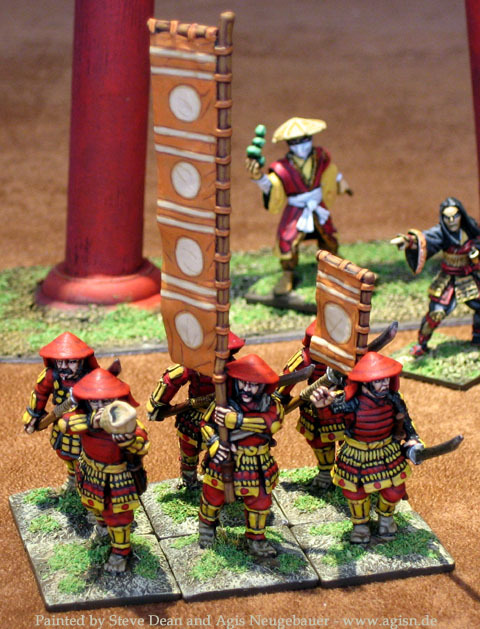 Chinese Sung Swordsmen from the brandnew TAG range. 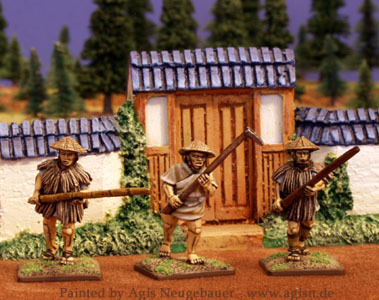 These minis are so far the best Chinese I have seen in 28 mm. As with all TAG minis they are also very paint friendly. Not too much detail, clean lines and good casting quality. Here you can see 3 Peasants and one Ashigaru from the Perry range. You can see some of my Clan War minis. All are out of production as far as I know.